The word ‘aziz is denotative of great power and superiority. In the Arabic language, one of the meanings of ‘aziz is the thing that is rare and unparalleled. Other meanings are the unattainable, the peerless and the sought-after. So these different meanings should blendtogether to give the full and perfect meaning of the epithet ‘aziz. Allah is the absolute MIGHTY, Who is too Exalted for theperception of mental faculties; He is the unattainable by recognitionand imagination; He dispenses by Himself with everything. 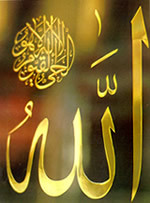 All Might, Supremacy,and Exaltation are attributed to Him; Allah has no peer to equalor resemble Him. To Allah, absolute existence is attributed; no partner has He, so no one is truly MIGHTY save Him; He is Allah.